Love shooting some hoops? You won’t go wrong then with the Three Point Detecting Basketball Shootout, where it will be able to make the right calls, knowing whether you’ve shot a three pointer or not. This unique basketball shooting game can do so thanks to a pressure-sensitive mat which is capable of detecting whether competitors have shot from two- or three-point range, while adding to the corresponding total without any room for human error. This will make the game a whole lot cleaner, but it does take away the human element of tension when wrong calls are made, opening the door to disputes and debates many years down the road. You can choose to compete head-to-head or against the clock depending on which area you would like to improve. Features include a sturdy tubular steel frame, an electronic scoreboard, and the all-important countdown clock. 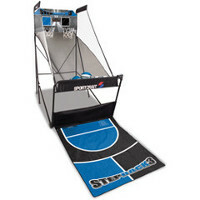 You can bring home this unique sporting equipment for $149.95 from Hammacher.